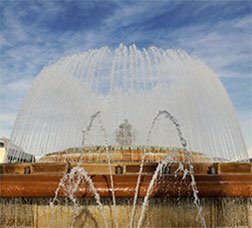 The Font Màgica, or Magic Fountain, is the main feature of a complex of fountains, cascades and pools on Avinguda de la Reina Maria Cristina, the street running from the Palau Nacional to Plaça d'Espanya in Montjuïc. 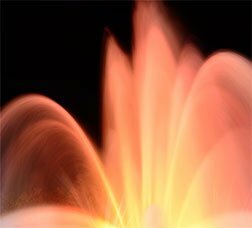 Check the times of the Magic Fountain sound and light shows. This unique water and light feature receives 2.5 million visitors every year and is an internationally recognised emblem of our city. 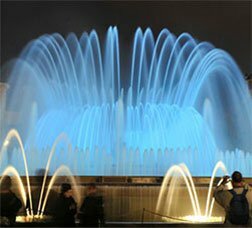 The Magic Fountain can produce around 7 billion light-and-water combinations by combining the hydraulic features and lighting it is equipped with. 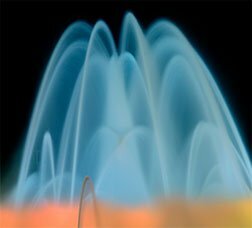 Check out the sequences programmed for the fountain. The Magic Fountain was built by Carles Buigas for the International Expo in 1929, on the site where Josep Puig i Cadafalch's Four Columns had stood before being demolished in 1928. They were later rebuilt in 2010. The spectacular Magic Fountain is very popular, and is best known for its sound-and-light shows. Around 2,600 litres of water a second flow through the fountain's three concentric pools, driven by a water-recycling system. In recent years, the traditional lighting has been progressively replaced with LED technology, due to its low consumption and the coloured lighting it offers. The Magic Fountain has also been using groundwater since 2010. Snippet of the Magic Fountain choreography based on hits from the 1980s. Snippet of the Magic Fountain choreography based on soundtracks from cartoons and animated films. Snippet of the Magic Fountain choreography based on pieces of Spanish classical music.